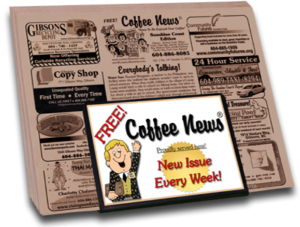 Why Advertise in Coffee News of Florida Lakes Area? THE POSITIVE VIBE: When potential Coffee News® customers see your ad, they are already is a positive frame of mind… reading the good news. EXPOSURE: Your ad in Coffee News® will be viewed by 1,000’s of targeted readers every week. It is equivalent to passing out 1,000’s of your business cards weekly, building top of mind awareness.